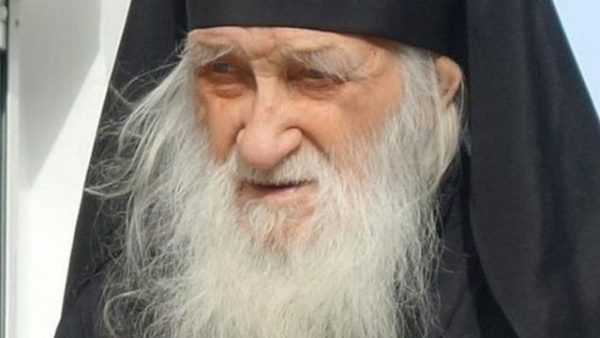 On 4 August 2016, Schema-Archimandrite Jeremiah (Alekhin), hegumen of the Russian Monastery of St Panteleimon on Mt Athos, aged 100, passed away in the Lord. His Holiness Patriarch Kirill of Moscow and All Russia offered his condolences to the brethren of the monastery. The text of the message is givenbelow. Please accept my wholehearted condolences over the death of Archimandrite Jeremiah, abbot of the Monastery of the Holy Great Martyr and Healer Panteleimon. Father Jeremiah’s life journey was long and full of afflictions and labours; however in all circumstances he, committed to his vocation, continued his zealous service to the Altar of the Lord. Archimandrite Jeremiah was a monk who set all his hopes on Christ and always remembered the words of the Holy Scripture: “God is our refuge and strength, a very present help in trouble” (Ps 46:1). For almost 40 year the late pastor carried on his shoulders a hard cross of his ministry as hegumen of the Monastery of St Panteleimon, showing concern for the spiritual growth of the brethren. With God’s help, much was done in the abode over the past years. Thus, centuries-old monastic traditions grew stronger; numerous pilgrims coming from various parts of the Orthodox world to the healing relics of the Great Martyr Panteleimon received warm welcome; the monastery’s buildings were restored and re-decorated. It is noteworthy that the Lord took our brother Jeremiah into His paternal embrace in a year marking the millennium of the Russian presence on the Holy Mountain, thus showing the importance of his contribution to the preservation and development of monastic traditions and to the strengthening of spiritual ties between the Athonite monasticism and Russia. I believe that by the intercession of Our Most Holy Lady Theotokos and Ever-Virgin Mary and by the prayers of the Holy Great Martyr and Healer Panteleimon, the All-Generous and Merciful Lord will accept the soul of His faithful servant in the heavenly mansions and grant Him rest from his righteous labours in a place where there is neither sickness, nor sorrow, nor sighing, but life everlasting. Memory eternal to the newly deceased Archimandrite Jeremiah.